Niall Mason says Doncaster Rovers have learned very quickly that there is less room for error in League One. Darren Ferguson’s side had the firepower to out-score several teams on their way to winning promotion from League Two at the first time of asking last season. But Rovers, who head to Charlton Athletic tomorrow boosted by last weekend’s 4-1 win over Southend United, have found teams in the third tier not only tougher nuts to crack but more liable to punish a mistake. Doncaster have failed to score in half of their 12 league games and have lost four matches by the odd goal. “There’s definitely a difference,” said Mason. “I think we’ve found that each mistake we’ve made, we’ve been punished for it. “And when we don’t take our chances you may not get another chance, whereas in League Two I felt we did miss a few chances but we’d always get one or two more and that would win us the game. “Or if we conceded one or two we’d go on and win the game 4-2 or 5-2 or something like that. “I think that’s the difference. “There’s finer margins in League One and you can see that as you go up the leagues it becomes more pronounced. “You watch the Premier League and it’s literally one mistake, goal, game over. “We can adapt to that,” added the 20-year-old. “We’ve learned a lot from the opening games of the season. “I don’t think anyone can doubt the performances. “It has been a lack of concentration for a minute or two, where we let sides back into the game or we don’t finish a chance, and then they go and get one chance and score. 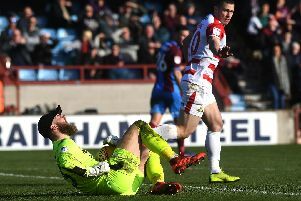 Victory over Southend was a much-needed lift for Rovers, although Mason insists confidence within the camp has not wavered despite some disappointing results. “We were really pleased with it but we also felt it had been coming,” he said. “We feel that we’ve played well for the majority of the season but we were just more clinical in this game. “I think we’ve played even better than that and lost.